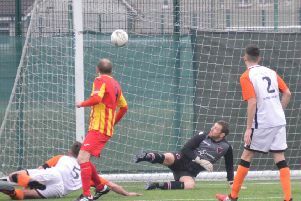 An excellent second-half performance from Kirkintilloch Rob Roy saw them safely into the last 16 of the West of Scotland Cup, reports Neil Anderson. 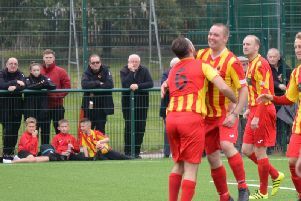 Stewart Maxwell’s side continued a promising start to the new year as they disposed of a plucky Thorniewood United side. After Lee Gallacher shot wide in the opening minute, the visitors went on the early attack with Gavin Mackie doing well to clear an Alistair Morgan corner and then Dillon Clark’s drive from outside the penalty box easily taken by keeper John Hutchison. Rabs responded and Alberto Vezza’s lob sailed wide before the breakthrough came in the 16th minute as Mackie’s deep cross was fired home at the back post by Vezza. Wood hit back with Scot Cowan’s ambitious free kick from 40 yards being comfortably saved by Hutchison; then, at the other end, Graeme Ramage’s 30 yard free kick flashed across the Thorniewood box with no takers. The Roy should have increased their lead on the half hour mark when Connor Hughes was sent through clear on goal but could only find the side net. The League Two vistors had a chance to equalise five minutes later but James Marr’s header looped over. A minute before the break Jordan Currie-McLean’s low shot was brilliantly parried round the post by keeper Jonathan Duncan, who was having a fine game for the visitors. Gary Stewart’s hook shot then narrowly cleared Hutchison’s crossbar, allowing the Rabs to go in with a narrow lead. But they started the second period with a bang, doubling their lead within a minute as Mackie’s angular shot sailed over Duncan. Two minutes later Gallacher beat Duncan with a powerful drive to make it 3-0. Rabs now had more confidence and a great move between Michael Tuohy and Ramage brought out a magnificent save from Duncan. Martin McBride’s free-kick from 22 yards was deflected wide, but to their credit ‘Wood kept plugging away and it was only a brilliant diving save by Hutchison denied Morgan. However in the 66th minute Rob Roy made it 4-0 when the Thorniewood defence failed to clear and Mackie was on hand to poke the ball home from close range. Nevertheless ‘Wood kept pressing and Hutchison did well to push Morgan’s effort against the post and John Kelly was on hand to clear off the goal line. However as the game progressed the Thorniewood defence tired and struggled against the strong running Gallacher and Mackie and it was no surprise when substitute Willie Sawyers latched on to a though ball and slotted the ball past Duncan to make it 5-0. With four minutes remaining Sawyers nearly added to his tally but just failed to connect with a cross ball in to the goal mouth. In the end it was the Rabs who ran out comfortable winners with an outstanding second half display and only a splendid goalkeeping display from Duncan kept the Roy’s goal tally down to a respectable level.